Gavin and I had determined that this year we would not be buying a Christmas tree. The cost and the waste don't sit comfortably with either of us but equally I'm not a big fan of artificial trees so we decided the time had arrived to come up with something else. As owners of a wood burner we both scavenge and accept offers of wood in return for us taking the said wood away and a couple of months ago Gavin went to an acquaintance's house to chop up and take away an old dead conifer for them. Whilst waiting for the wood to season I noticed that we had several ideally sized pieces to use as decoration and suggested we make these branches back into a tree of sorts! So last weekend we began by positioning the first of these branches in the centre of a medium sized planter. We then arranged two further branches of a similar size around the centre branch along with some smaller branches and twigs. We discussed a few options on how to hold it all in place but ultimately we found a part bag of plaster buried in the shed that was out of date and going off. We mixed this to a very thick consistency in a bucket and then added it to the planter encasing the branches. Within thirty minutes the plaster had set. At this point we carried the arrangement inside and put it in position on our sideboard. It fitted beautifully. Any stray branches were clipped away just like with a real tree. Decorating began with a coat of white undercoat - again found in the shed. 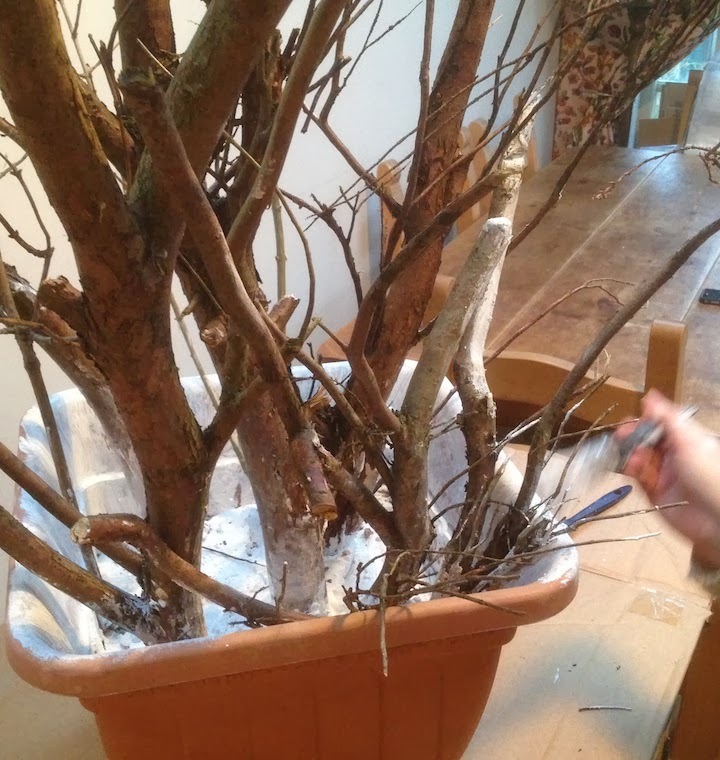 We covered the plaster in the paint to resemble snow along with the edge of the planter and sections of the branches. I really like how the branches look with their light dusting of 'snow'. I then rather belatedly decided I didn't like the colour of the planter so we set about painting it in some green shed paint and the whole thing really began to look very Christmassy. 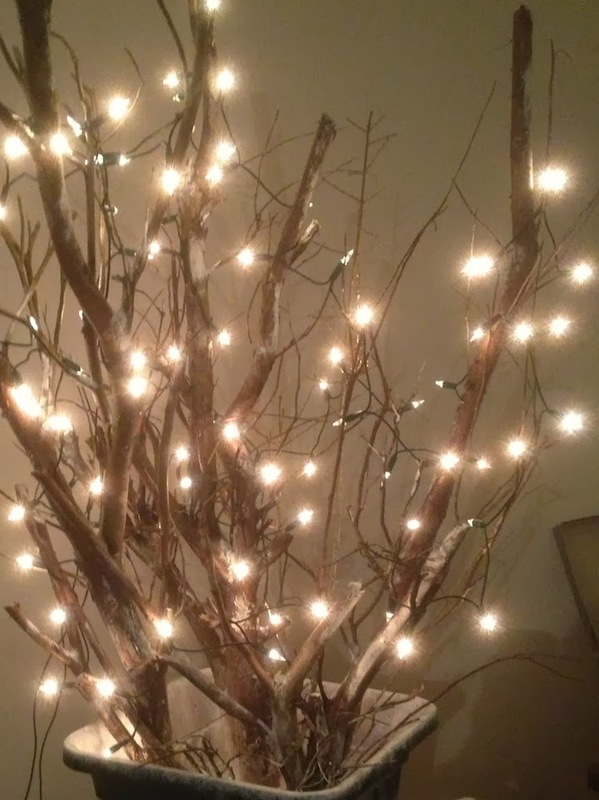 We had a spare set of lights which we wrapped around the branches from within the planter to provide uplighting through the tree which I think works particularly well. And then came the decorations themselves. I already had all the decorations so there was no additional cost involved. Admittedly its not the easiest tree to decorate so its important to pick branches that aren't too smooth so that you have places to hang the baubles from. I have to say I am absolutely delighted with the finished results. We already had the lights and the decorations so this year our tree has cost us not a penny and after Christmas we can chop down the branches and put it on the fire. But in the meantime though I'm going to enjoy looking at my unique tree for a little while longer. Don't forget you can still get 15% off products on the website until the end of December by quoting CHRISTMAS13 and hopefully I'll get the chance to pop back to the blog before Christmas Day but if I don't I would like to wish everyone a very Merry Christmas and very best wishes for 2014. If this week is anything to go by, the next couple of months leading up to the move to our farm in the countryside, are going to be very, very busy. The great clear-out has begun to try to reduce the amount of stuff we have both hoarded before physically moving house. With this in mind, it may mean I forget to blog - I admit it doesn't take much to forget to do so - so wanted to take the opportunity to thank everyone for reading and supporting me this year and by way of thanks I am offering £10 off the printed version of A Stitch in Time Volume 2 until the end of the year. That means the hard back book will be only £25 (plus postage & packaging) until 31st December 2013. All you have to do is enter the code CHRISTMAS13 when purchasing through the shop. As mentioned above, the offer will run until the end of the year, but if you would like the book to reach you before Christmas, orders need to be placed by Thursday 19th December if you are in the UK, or by Friday 13th December if you are in Europe or the USA. 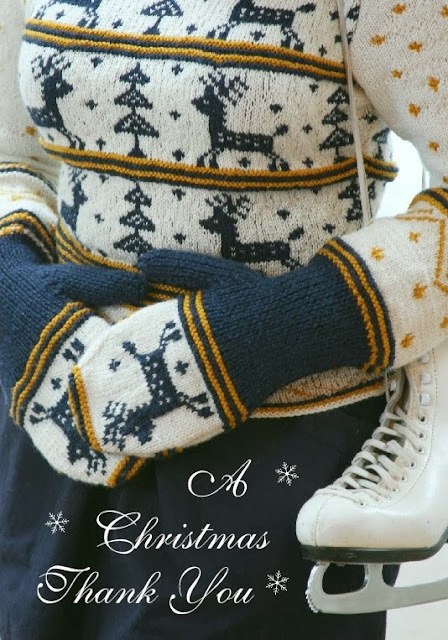 Unfortunately the last guaranteed Christmas deliveries to Australia, New Zealand, Canada and other countries not already mentioned have already passed but these orders usually take an average of two to three weeks to arrive. 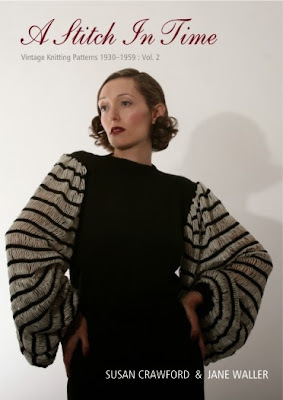 If you've already got the book, or would like to purchase anything else from the shop I am also offering a huge 15% discount on all items in my shop (excluding A Stitch in Time volume 1 pre-orders) or on my ravelry page. Simply enter the code THANKYOU13 to get your discount on your order. The discount doesn't apply to postage and packaging but is available to all purchasers. Again I would like to thank everyone for their support throughout 2013 and here's to a simply fabulous 2014! As we freefall towards the end of what has been in many ways a turbulent year, with many good and some dreadfully bad things happening, Gavin and I find ourselves closing 2013 with the most dramatic and exciting news we could have hoped for. For most of the year I have been receiving treatment and ultimately surgery for early stage uterine cancer. I have been extremely lucky and have been given the all-clear and, whilst never life threatening as it was detected in its very early stages, it still scares you and makes you look at much of your life in a different light. For us, it has helped motivate us in our determination to find a new home. Since our daughter went to university we have been planning a move to a rural location but with other family commitments there have been many other added considerations when looking for the perfect place. And somehow amongst the constant fray of everything else, we found it. Our ideal home, workplace and inspiration all rolled into one. It has been an agonizing three months of applications, business plans, discussions and interviews and finally, two days ago we were offered the tenancy. 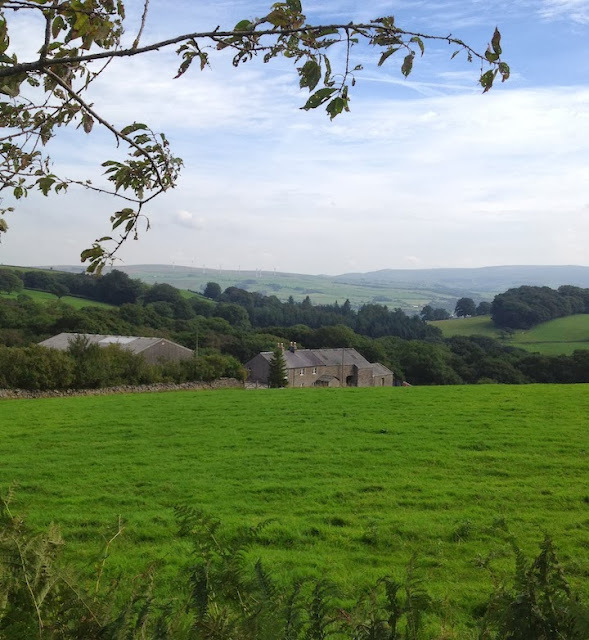 Nestled in the hills in the crossroads of Cumbria, Lancashire and Yorkshire is the tenant farm that is to be our home. Here we will finally have room to run our business properly. To store and distribute our books and yarns, to potentially have an occasional yarn shop or open day, to have a design studio and significantly to have a classroom/workshop from where I can run classes and also invite other teachers as well. In addition to this we will be able to realise our dream of keeping our own sheep and pigs and to grow even more of our own fruit and veg. There are lots of other plans and much renovation to be done which I will share with you over time. See the roof of the big barn on the left of the photo? We have some amazing plans for that!